Arby’s recent acquisition of Buffalo Wild Wings that created BDarb’s—sort of the liger of the food world, except with dipping sauce—is prompting eager speculation about menu crossovers. Consumers are especially jonesing for Arby’s curly fries at Buffalo Wild Wings. Despite demand, though, CEO Paul Brown says it’s not going to happen. “As many requests as we’ve gotten for curly fries at a Buffalo Wild Wings, and we’ve gotten a lot of them ... we’re not going to do that,” Brown tells Business Insider. (Presumably, BDarb’s would do anything for love, but, you know, not that.) Instead, Brown says, the new duo will focus on boring stuff like best practices and back-of-house technology. 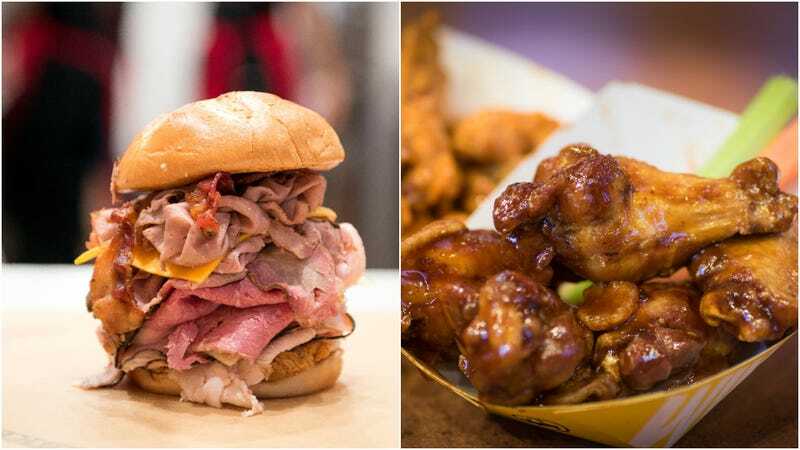 Because we love a good game of wild speculation and wishful fast-food thinking, we at The Takeout began brainstorming our own Arby’s/Buffalo Wild Wings crossovers that would be even more radical than curly fries. Who’s with us? Weird wings: Arby’s has pull with less-traditional-meats producers, as evidenced by their venison and pork-belly offerings. Why not put those relationships to use for Buffalo Wild Wings’ menu, which could begin serving turkey drumsticks (à la Medieval Times) or snack-sized quail wings? TVs at Arby’s: Long have we dreamt of an establishment where we could ensconce ourselves in pleather booths for hours, chomping mindlessly on roast-beef sandwiches while taking in one favorite sporting events. Nothing pairs quite as well with an Olympic viewing party, frankly, as The Meats. Beer at Arby’s: Hey, while we’re at it, why not copy Buffalo Wild Wings’ beer menu at Arby’s? Business Insider reports this is actually on the table: The CEO says he’d explore the idea of serving beer at Arby’s following the BDarb’s merger. Chicken wings covered in Arby’s sauces: This seems like a natural fit. Would you slather your BDubs’ wings in Horsey Sauce? We would. @nihilist_WildWings: It’s only fair that Buffalo Wild Wings have a nihilistic, unaffiliated Twitter account to call its own, too.